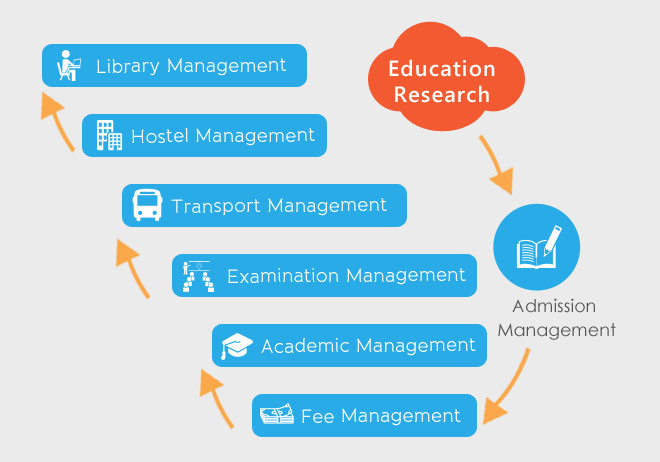 Swash provides an excellent cloud based ERP for campus management software KENCampus™ which helps resolving the tiresome tasks associated with an educational organization; starting from admissions, academics, library to examination and canteen management. In order to transfer and obtain knowledge flawlessly and to track as well as record entire operations of educational institutes, enhancing streamlining of the business processes, KENCampus™ assists education sector to deal with a multitude of activities like finance management, placements, hostel management, library management, admissions and many other internal and external processes as educational institutions are becoming gradually intricate and are not limited to delivering education alone. By providing assistance to any educational system in taking timely decisions so that they can focus on what they do best, KENCampus™’s comprehensive business management capabilities is built to reduce costs, optimize the functioning and operations of the institute. Our advanced delivery models and technological process provides an extra edge to the educational industry to be ever profitable and ready for every challenge which the industry faces time and again. To get more details about Swash's technological platform, development and models, click here. Due to its several advantages for its scalability and security, cloud application development is widely accepted in many industries. However, there are a wide range of different settings in which the cloud may be a very valuable option. Perhaps one of the most significant is the education sector. KENCampus™ allows a stronger and integrated network creation of student’s data. It helps institutions with a suite of offerings that caters to seasonal academic events and access to ongoing classes, course materials and examination information to have a backup of all the information whenever required. By using our cloud ERP services one can improve and extend the level of education they offer. For knowledge sharing, we merge classroom learning with digital techniques. Our software is designed with the primary object of incorporating different divisions and components of the institution. As such, to bring all functions of all departments under uniform control any university or college can use the software. There is no paper costs involved as all tasks and jobs are worked on the software. Furthermore, the process of managing records and data become uncluttered and easy. KENCampus™ is effectively designed for the busy education management professionals by merging user friendly interface design with most advanced software engineering. Ever since we began, our goal was simple - make you perform better. KENCampus™ provides comprehensive learning solutions for various educational institutions. Here some of the best features of our advanced educational software. The Admission Module helps managing the entire admission process right from student counseling, to accommodation, scholarships & settlement transport to fees collection and mess management. The admission module ensures that admission process is completely simplified. The Student Academic Calendar module facilitates you to manage academic calendar, time table creation and attendance and leave management of students. Examination Module helps managing the examination procedure easily. It eliminates all the manual work. It facilitates time table creation for the all stream, course and semester, results, internal exams etc. Moreover, it provides exam result information to students and their parents via SMS / email alerts and publishing the same on their corresponding dashboards too. This module simplifies the administrative procedure. It eases administration of university, college and other educational institutes. It also helps managing tasks like leave and attendance of employees and faculty. With the Campus Info module information of students, employee or staffs are available easily. Its management information system and analytics helps with easy decision making. Multiple reports can be generated like faculty/ student report, performance analysis, total fee collection, attendance and leave etc.